President Obama hasn't decided whether he will approve the expansion of the controversial Keystone oils sands pipeline just yet. But in a strange turn of events, some opponents of the plan are finding support for their position from an unlikely source: Wall Street. Obama has long said that he will only approve the project if it doesn't significantly contribute to climate change. He reiterated that in a recent interview with The New York Times. The State Department has said it won't because it thinks the oil sands, which are dirtier than conventional oil, will get developed no matter what happens to Keystone. In other words, that oil is going to leave Canada somehow ... so it might as well be through the United States. But several analysts at investment banks and other financial firms disagree. They think that if the Keystone XL project isn't expanded, development of Canada's oil sands may slow. Goldman Sachs (GS) analysts wrote in a report in June that if Keystone XL encounters more delays, oil supply "may remain trapped in the province of Alberta." 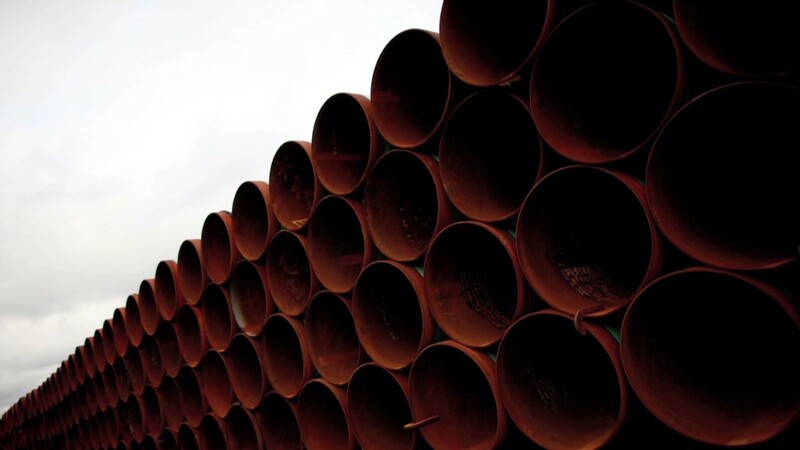 Analysts with RBC Capital Markets said something similar, arguing that "should Keystone XL be rejected, Canadian oil sands producers will need to rethink expansion plans, timelines, and export pipeline solutions." If the Goldman and RBC analysts are correct, then the White House does have to think much more seriously about climate change risk. Still, other analysts aren't as gloomy. Michelle Dathorne, senior oil and gas analyst at Standard & Poor's, thinks the oil will eventually get to market, but without a pipeline to the U.S., the industry's goal of tripling output from the oil sands over the next few decades may be hard to hit. "There are options, we can still get the oil out of Canada," she said. "But it may stall the production growth beyond 2015." Canada's oil sands are thought to be some 17% more carbon intense than regular crude oil, as massive amounts of heat are needed to separate the oil from the sand. TransCanada (TRP), the company building the Keystone pipeline, concedes this oil is more carbon intense than regular crude. But the company and other pipeline advocates say it's no dirtier than other forms of heavy oil, like that from Venezuela. They also say they are working to reduce that 17% figure. The State Department's conclusion is based on the assumption that if the U.S. doesn't approve the pipeline, the oil will still find its way to market via rail car or pipelines to Canada's East or West Coast -- where it can be put on a ship and sent to China or somewhere else. But that may be harder than it sounds. Shipping oil by train is much more expensive than sending it by pipeline. And there's considerable opposition within Canada to building more pipelines to the coasts. "The State Department got it wrong," Susan Casey-Lefkowitz, director of international programs at the Natural Resources Defense Council, an environmental advocacy group, wrote in a recent blog post. "Keystone XL is critical for tar sands expansion." NRDC asked the public to petition the State Department in a bid to get it to change its analysis. Seventy thousand letters were sent, said Casey-Lefkowitz. There's a chance the State Department will modify its opinion on the project's climate impact. Its preliminary analysis is just that -- a draft -- and the final analysis is supposed to incorporate both public comments and any new relevant research. The final report is expected later this summer or early fall. An administration decision is expected before the end of the year. 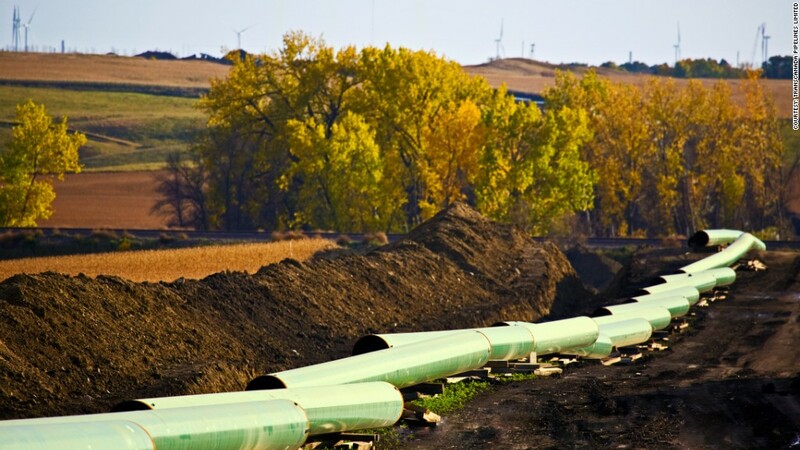 But if State does not change its opinion, analysts expect the pipeline will get built. Robert Johnston, head of global energy and natural resources at the Eurasia Group wrote in a note this week that it still believes there is an 80% chance of Keystone XL getting approved by Obama before year's end. He said climate remains the key issue. So now Obama has to decide who's right about what will happen to further oil sands development if he says no: the State Department or Wall Street.